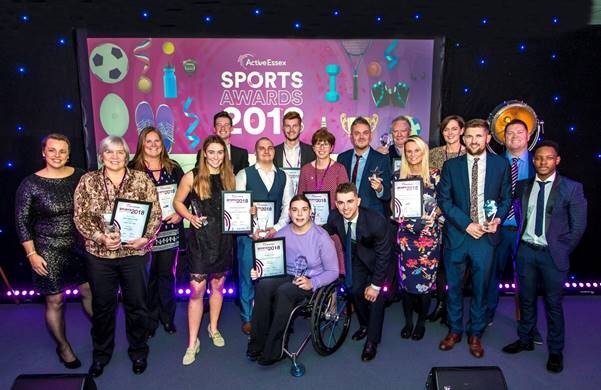 The winners of the Active Essex Sports Awards 2018 were crowned at an inspiring awards ceremony which celebrated sporting achievements from grassroots to professional level. England Netball captain Jo Harten, from Harlow, won the coveted Sports Personality of the Year award after leading her country to Commonwealth Games glory with a dramatic victory over Australia earlier this year. Now a household name, the gold medallist, who has competed for England for over a decade and amassed over 80 caps, was unable to attend the glittering ceremony at Chelmsford City Racecourse on Wednesday night (December 5th) due to a prior commitment with the England Roses. However, in a video message played to the audience, Jo said: “I can’t quite believe I’ve been voted Active Essex Sports Personality of the Year. To win this award in the company of Alastair Cook and Hannah Stodel (both shortlisted) is really something quite special. “2018 has been the year of my life in terms of netball. Team England won gold at the Commonwealth Games and we competed in the Quad Series and other international events. Individually, I played for The Giants in Sydney and we placed third overall in the league. Her parents, Christine and Barry, attended the event – and Barry was visibly proud as he collected the award on her behalf. The award was one of three categories decided by public vote, with the Disabled Sports Personality of the Year, won by Freya Levy, and the Unsung Hero awards, won by Nicola Arnold, also decided by the Essex public. Freya Levy, of Rochford, represents the UK and England in Rugby sevens and scored her first international try on her debut game in France in April. Nicola Arnold, of Harlow, has been involved with the Harlow Penguins Swimming Club for over 35 years – from competing nationally to training the next generation of swimmers. Meanwhile, Max Whitlock, a previous multiple winner at the awards ceremony, stepped to the other side of the podium this year to present the Young Personality of the Year award to Ottilie Robinson-Shaw – the Tendring teenage flyer who struck gold at last year’s Freestyle Kayak World Championships. Max said: “It was great to be part of another fantastic night of deserved recognition for Essex’s favourite sporting stars. I know first-hand just how much it means to receive such fantastic acknowledgement for all your hard work and effort at events like these. Now in their 11th year, the awards recognise the people, clubs, organisations and volunteers who make sport and fitness accessible to people across Greater Essex. The awards are part of an ongoing commitment by Active Essex to change one million lives by getting more people around Essex active. With awards ranging from coach of the year to education champion, and active workplace of the year to services to disability sport, the awards showcase how sport and physical activity touch so many aspects of people’s lives. The awards were presented by Heart FM’s breakfast show presenter, Su Harrison, and Active Essex board member Steve Mitchell. A full list of winners can be found below.